Completely renovated in 2015 with new cabinets, granite counter tops, flooring, doors, trim, etc. Beautiful first floor, non-smoking unit with a King bed and Queen Sofa Sleeper. For boaters, our condo is ideally located on the canal at the 8th tee box. We are located in the quiet section of the community and our condo is perfect for a couple or small family. You can relax on the oversized deck and watch your children golf or fish while you BBQ on the gas grill. The beach is just a 5 minute walk and BEACH SERVICE IS INCLUDED in your rental (March 1st - October 31st). That's 2 chairs and an umbrella set up for each day of your stay. If you prefer the pool, one of the five swimming pools is only steps from the front door. Sandpiper Cove offers 43 lush acres of paradise with 1100 feet of private pristine beach & emerald green waters along the Gulf of Mexico (including private gated beachside parking). A Beach Pavilion Snack & Service Bar serving lunch, snacks, drinks, rental of beach chairs, umbrellas, sea-kayaks, parasailing. FREE Amenities include a 9-Hole Par-3 Golf Course, Putting Greens, 5 Swimming Pools, 3 Hot Tubs, 6 Tennis Courts, Horseshoes, Shuffleboard, 24-Hour Security. Boat slips can be rented for an additional fee. Queen sleeper sofa, 40" flat screen TV, and surround sound stereo. Completely remodeled in 2015. Full size kitchen well stocked with pots, pans, dishes, and utensils. We are a retired couple from Northern Ontario and vacationed here for the past 6 years.. We have stayed in this condo in 2015 and this year 2017 in the renovated unit. The renovations are extremely impressive and workmanship is excellent. The condo is easily maintained and provides all the utensils and dishes required. The large deck provides lots of sunshine and the grill is much appreciated and utilized fully. Beach service is awesome. The owner Kim is excellent and very accomodateing. We are definately rebooking for 2018 and look forward to returning to this unit. (July 2015) Summer vacation and daughter's birthday trip - This was our second stay at Sandpiper Cove. We really enjoyed our condo, it had everything you would need. All we brought was our food and sunscreen. We brought two children with us (3 and 8). They loved the pool and even tried to play golf. We celebrated our daughter's birthday in the condo. Just the four of us. it was very nice and peaceful. We will definitely be back. (July 2015) Great stay! Our family thoroughly enjoyed our stay at this condo. There were no surprises...everything was just as pictured. I love the fact that it was a gated area, made me feel safer. We decided not to walk to the beach, so we drove to the parking lot right across the street; this worked better for us as we had our five-year old. There are restrooms located at the small eatery there, which is very convenient. Service was great! One recommendation would be to call ahead and let them know that you're coming so they can reserve your seats and you could possibly get a better spot. However there was no really bad spot, the ocean was great and the weather was wonderful during our stay. One of the pools is located right across from the condo; it goes from 4 1/2 feet to 8 1/2 feet deep. It was very nice. The oversized deck was great, and we made good use of the grill. The oversized tub and large bathroom was wonderful as well. We would definitely stay here again; The condo had everything we needed and more! 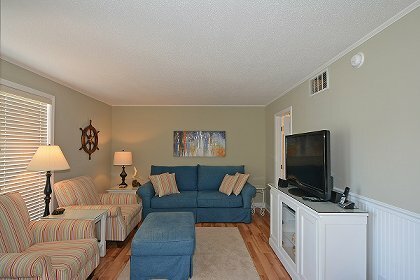 (April 2016) Excellent Stay - The condo is as advertised. It is newly remodeled and is very nice and clean. 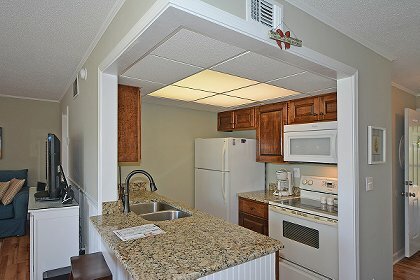 The condo is just a short walk or drive to the beach and is very convenient to everything in Destin. The owner, Kim is very nice to work with. She is very thorough and quick to respond. I highly recommend this unit. (June 2015) Great Condo &#8211; We thoroughly enjoyed our stay in this condo. This newly renovated, lovely decorated condo was all that it was advertised to be. The condo came with anything extra we could have needed for our vacation. The tub/shower was huge and a great addition to the bathroom. The condo had a comfortable king size bed and plenty of and closet and drawer space. The deck was very big with a great seating area and grill that offered a great view of the canal. The walk to the beach took just a few minutes going over the walkway bridge. This condo came with linen service that offered fresh towels whenever needed. Hope to stay in this condo again in the future. (June 2015) Very nice place to stay. &#8211; We enjoyed our time in this condo. Our first impression was very good. It had been recently renovated with good taste and we found it clean, fresh and with all the necessary items for our stay. We chose this place in part because of the nice deck with a view of the canal. It is a nice place to relax after a day at the beach, or have an early breakfast. Because of its location, it did not get direct sunlight early morning nor late afternoon. The owner was helpful, courteous and friendly. The pools in the complex have different depths for different uses. The nearest pool is mostly very deep, but near the restaurant there is another one mostly under 4&#8217;, more suitable for young kids. (January 2015) Fabulous Vacation &#8211; We are snowbirds from Northern Ontario and were fortunate to secure this condo for 3 months. It is one of the best locations and located on the 8th fairway overlooking the canal and on the ground floor. The large deck is awesome giving you sun from 9-5 and beautiful sunsets. The condo was clean, bright and comfortable with plenty of closet space and storage. There are lots of activities to take part in at the complex, golf, tennis, shuffleboard and swimming. The owner is great to rent from and we were in constant contact with her before and during our stay. She is very helpful, friendly and courteous. We loved staying her and look forward to next year. (June 2016) This is the one! - Let me make this simple. If you are married with 2 kids, want the beach and location, this is the place for you. We have been going to Destin for 15 years and have stayed at 15 different places. Finally, we have found a place that we can settle into each year without the time invested in looking for a place. The owners are so easy to get in touch with and they literally do everything in their power to make your stay perfect. Sandpiper Cove is very nice. It is a resort that cares about you. Let me say that this means a lot. How about beach service, yes that too. Very nice to just tell the beach boy your condo number and he directs you to your set up without any sweat on your part! Great! The beach is gorgeous and the water is fabulous. Fine dining galore and we like the fact that the fish market is right by us so we cooked fresh gulf fish many of the nights. My pleasure was the layout of the condo. The deck was over sized and had a great view of the canal and the golfing right there with us. Peaceful area with a condo that was clean and very relaxing. Many windows let you enjoy the beach! I just hope you do not try to rent the condo when I want it too!!! (August 2016) Great Condo - We just left and we will definitely be back. Very nice condo! Just perfect for me, my husband and son. Owner is awesome! (July 2016) We always enjoy our stay!!! Another wonderful week at Sandpiper Cove. We loved our condo. (July 2016) The unit was found to be as described, pictured, and advertised with no surprises. Unit was nicely updated and very well maintained making for a worry free stay. Deposit: A $200 deposit is required to secure the reservation. Cancellations and Refunds: Cancellation: If you cancel the reservation within 2 weeks of your arrival, you forfeit the deposit. If it is more than 2 weeks prior to arrival, there is a $25 service fee.